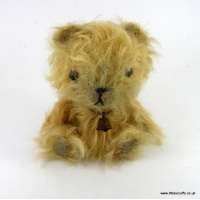 Miniature Mohair Bears handmade by Jean Grogan. Hello, my name is Jean Grogan and I have been creating miniature bear for the past 15 years or so. My first and only much loved childhood bear went missing during a house move some 20 years ago. Perhaps it was with him in mind that I began making 'old bears'. I find that each one seems to take on an identity of his/her own and I never tire of making them. I have many different styles of bears, they all, however, have that 'much loved' feel to them. I have my version of the soldier bears that were given to soldiers going to war in WW1 by their loved ones.Recently I have added Sailor Bears and The Visitors Also, during the past couple of years I have been making more and more dogs and other animals including pigs, giraffes,rabbits,elephants... oh and a cow! Please look in my Gallery to see past creations. I make bears 7 days a week and almost in my sleep so there are always new bears going on the site! Please add me to your favourites or join my mailing list if you would like to be notified when new bears go onto my site. 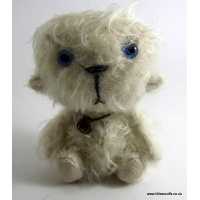 All my bears are hand stitched using materials such as mohair, viscose, alpaca, and vintage upholstery velvet . I have become quite obsessed with sourcing out vintage and unusual fabrics and love using them to make different bears They are all fully jointed and are weighted with steel shot. Each bear comes with a sewn in label saying Little Scruffs.